In a large American city was a church with an innovative and captivating minister. The minister had grown the church over a couple of decades of hard work and he was well-respected by his church members and by the local community. His passion was for caring for the homeless and those who had fallen on hard times. He spent a large amount of his time meeting these people’s needs, and over the years, his work had made his city a much better place to be. But something happened at his church which inhibited his ministry: tithing fell. Nobody knows how or why it happened, but it did. At first it was a small amount – just a few dollars week on week – but after several months of dropping figures, it became precipitous and the bank accounts ran dry. The church laid off a few members of its staff and stopped various small ministries which it had helped support. It even recalled a missionary. But time went on and the belt kept getting tighter. The minister became more and more anxious about the situation and, as it seemed inevitable that his ministry for the poor would have to be stopped, he began specific entreaties from the pulpit, asking his flock to give more. Week after week of pleading from the pulpit ensued, but without effect; tithes continued to decline. Finally, with every other avenue of savings exhausted and the church’s accounts dwindling to nothing, the minister stepped into the pulpit and began to preach about the righteousness of giving. “Tithing is an act of worship,” he said, voice ringing through the sound system with both conviction and urgency. He followed the statement up with a big sigh and then made eye contact and gave a nod to a big man in an ill-fitting suit who was standing at the back of the auditorium. At this signal, the big man closed the doors and chained them shut while several other large men who were sitting in the pews along the outside stood up menacingly. The large men formed all of the church-goers into a long line and marched them toward the one door still left unchained. The large men then began shaking down men, women and children. Each one required to hand over a tenth of what they had in their pockets, in their bank accounts and of their possessions – rings, necklaces, watches and clothing – before being allowed to walk out the door. This is obviously a fictional story. No true minister of God would do such a thing. In fact, no minister of God should be that anxious about how God will provide for the ministries of the church (but, I digress). The simple fact is that if this were to happen it would be a major scandal. Not only would it be scandalous because of the illegality of it, but it would also be a horrendously un-Christian thing to do. Am I right? But if you asked yourself, “Why is it un-Christian?” You’d probably respond with some line of logic like: It’s not right to compel someone to give to a church or ministry, regardless of how much good might result. The minister doesn’t know whether or not his parishioners are giving an adequate portion of what they have to God – only God knows. In fact, giving a tenth (a tithe) is just a guideline anyway – the action of giving itself being the important factor as it is definitely an act of worship and a revelation of the giver’s heart, whether more or less than a tenth. It is not the act of giving itself which is righteous, but the attitude of love, mercy and justice behind the gifts (Mt 23:23; Lk 11:42). Since giving is an act of worship, it is between an individual and God. In other words, the whole scenario is wrong because the minister is injecting himself into a place where he doesn’t belong; he’s making himself the intermediary in a relationship between God and another sinner. That’s the Holy Spirit’s job, not the minister’s … as if the minister could offer pardon in exchange for some monetary contrition (isn’t that the issue with which Luther had a problem?). I think this line of logic regarding compelling someone to do something he/she has not chosen to do on their own makes a lot of sense … rationally and spiritually. To be honest, I’d be really surprised if there were anyone who called him/herself a Christian who would disagree. Why? Because: 1) it would be heresy to believe that Christ’s sacrifice is insufficient to save us (2 Cor 12:9; Col 2:10) – implied by the belief that giving X amount of what we have somehow leads to salvation – and 2) it would be heresy to believe that there is any mediator other than “the man Christ Jesus” (1 Tim 2:5) – implied by the idea of anybody other than God being the arbiter of what level of service is right or wrong. Which makes me wonder about some who call themselves Christians and yet then advocate for a socialist welfare state … or even big government in general. I understand that inevitably most Christians who advocate for more government programs do so out of a desire to help the poor and less-fortunate. To be sure, taking care of the poor and destitute – the orphans and the widows – is a commandment of Christ and a laudable undertaking for a Christian and for Christ’s Church. But if we wouldn’t argue for a church’s minister (someone “righteous”) to shake his congregants down for tithes (something biblical) using muscle and locked doors, why would we argue for government (a necessary, but worldly, evil) to shake down someone who has earned what he has in order to give to someone whom the government deems more deserving (something absolutely UN-biblical) at the point of a gun (just try telling the IRS you won’t pay your taxes and see how gentle they are)? And that is what socialism and big government are, right? The forced redistribution of wealth either on the macro scale through the centralization of the means of production or on the micro scale through the centralization of the wealth production creates. Socialism and big government inevitably metastasizes into unaccountable, bureaucratic officials saying, “You don’t give enough of what you have to help the needy/nation, so I’m going to make you give what I think you should give.” The one who earns has a gun put into his face until he turns over that which he has produced by the sweat of his brow to a government bureaucrat who then skims some off of the top for his office’s continued existence before redistributing it to a constituent group that voted into office the very person who appointed the bureaucrat in the first place. Obviously there are multiple things wrong with this model both morally and spiritually. So let’s look at a few of them. First, we must ask ourselves if it is ever right to compel someone to support something he hasn’t chosen to support through his own free will. Now, we know that we are “chosen” by God – elected and sanctified by Him. But we also know that He “[stands] at the door and [knocks]” waiting for us to answer (Rev 3:20). Therefore there is a response required of us – a response of faith from the individual to open the door and let Him in. Being omniscient, He knows who will open the door and who will not, but it doesn’t negate the choice we have been given. This ability to choose extends beyond salvation and all the way to everyday actions. By acknowledging that we have this free will we also simultaneously establish the corollaries (applicable in this argument) that: 1) a person of conscience is to be highly prized by society, and 2) that any action by a third party which forces a person to violate his conscience is unrighteous. If God doesn’t force us to believe in Him and do what He says (to the very salvation of our souls), how can we argue that we have the right to force each other to do anything morally or spiritually? Thomas Aquinas said, “Because of the diverse conditions of humans, it happens that some acts are virtuous to some people, as appropriate and suitable to them, while the same acts are immoral for others, as inappropriate to them.” Paul says roughly the same thing, but goes a step farther in 1 Corinthians 8 in talking about disregard of the weak conscience of a brother when eating meat sacrificed to idols, “When you sin against [the weak brother by destroying them with your knowledge, you] wound their weak conscience [and] you sin against Christ” (vv. 11f). This is a frightening thought. Our actions can shake another person’s faith and therefore we sin against Christ. Which makes us ask, how can we possibly NOT sin against Christ in that way? I think that question is answered a couple of verses later. Paul says, “Therefore, if what I eat causes my brother or sister to fall into sin, I will never eat meat again, so that I will not cause them to fall” (v. 13). He’s not saying that we should all be vegetarians or that we should cease doing anything – sitting around idly – for fear of hurting the conscience of a brother. He’s saying that we should be sensitive to the concerns of those around us and that we are not to purposefully do something which violates the conscience of another. Because that’s the principle that the Spirit has established through the pen of Paul, doesn’t it make even more sense that we wouldn’t want to purposefully make someone else violate their conscience by compelling them to act in a manner against their free will? And, even if the action we compel has a good end product, how can compelling the action itself be justifiable when to do so is to “sin against Christ” by hurting the conscience of someone else? Even more so, if a government office or official seizes a person’s earnings in order to support a government function with which that person conscientiously objects (like the financial support of abortion or the indolent), he forces complicity with it – both wounding the conscience of the person and sinning against God. We might even then say that those who voted that government official into office (or voted for the official who appointed him) have also sinned against God by wounding the conscience of another person. Granted, there are necessarily going to be people offended in all government positions, but many fewer will be offended the smaller the government gets and the less a government appropriates under its purview. Second, we must note that stealing and covetousness are necessarily a part of the social-welfare state model and not necessarily a part of free enterprise. Free enterprise can certainly result in greediness or materialism, but those things are not a necessary consequence of that freedom. In a free market, the fact that your neighbor has something that you would like to have doesn’t mean that you have to take it from him … you can earn it yourself. The pie IS NOT fixed (no matter how many socialist economists there are who refuse to look at the evidence from 500 years of growth within Western free markets). Your neighbor can have a nice car AND you can have a nice car … and it doesn’t mean that you’re taking those two nice cars from some poor blokes in East Rutherford, New Jersey and Clovis, New Mexico. However throughout the life-cycle of a social-welfare state the bureaucratization of resources necessarily requires stealing from the productive, either for redistribution to the regime’s favored constituents or to centralization under state control. As the social-welfare state matures into its latter stages, production grinds to a halt due to the productive no longer having incentive to be productive and thus results in the pie becoming fixed (or shrinking). This leads directly to more covetousness as the money and possessions of a neighbor are now the only money and possessions available to a non-content heart. As Lady Thatcher pointed out, “The problem with socialism is that you eventually run out of other people’s money.” You can’t take money from those who voted against you for long before you have to start eating your own (the people who voted FOR you). The modern social-welfare state is a Donner Party making its way foolishly into the mountains on the eve of a well-forecasted blizzard. Third, we must acknowledge that there are differing roles for the government and the church of God. It is very clear in the Bible that we, as Christians, are to obey the governmental authorities (Mk 12:13-17; Rom 13:1-7; 1 Pet 2:13-17) and that the earthly governments have been “established by God” (Rom 13:1) as a necessary entity to “bear the sword [as] agents of wrath to bring punishment on the wrongdoer” (v 4). Since God does not establish unnecessary things, and because we know that God hates tyranny (see Ez 25 and Is 13 for examples of what the Lord will do to the nations that oppress), the question is not about whether government should be either lawless or authoritarian. Instead, a “righteous” (if we can use that word to describe an earthly, man-led institution) government must lie somewhere in between. Admittedly there is a lot of ground that can be argued over in deciding where on the spectrum between anarchy and totalitarianism a “good” government should be. However, one thing that is NEVER specified in the Bible is that government should be providing for every need of its citizens – not even the poor and destitute. The Bible certainly specifies that justice should reign and that the poor should receive just judgements and be defended when they are being mistreated (Ps 9; 12:5; 82:3; 140:12; Prov 3:27f; 14:21; 22:22f; 31:9). What is most interesting when we read passages of this kind in the Bible though is that the condemnation of oppression and injustice is very general, however there never seems to be an expectation that an unbeliever will move proactively in a merciful and loving way. Those proactive movements are only commanded to people who call on the name of the Lord. To put it another way, even though separation of church and state (as it is popularly misunderstood today) is NOT in the Constitution, it IS present in the Bible. The state is not expected to do anything good beyond uphold justice (to “bear the sword”). How can it do good when it is secular and run by fallen men? However the church is expected – individually and corporately – to be the apparatus of mercy and love within a fallen world because it is God’s body – sanctified and forgiven – amidst a sinful world. Fourth, we have to realize that if we are looking to the government for relief from our suffering it is a misappropriation of our trust! This may be the most important point to make in regard to the size and scope of government from a Christian perspective. Throughout scripture we are never told to rely on any human institution, but we are told time and time again to “trust in the Lord with all [our] heart and lean not on [our] own understanding” (Prov 3:5). It is certain that God chooses to work through fallen humans and human institutions to bring about His will. To deny that is to deny His sovereignty. But how much more serious is it to deny His sovereignty by not trusting Him to act apart from the work of some human institution? Do we really believe that He needs the help of a bunch of power-hungry bureaucrats and politicians? Do we honestly think that God cannot work just as much good through a small, unassuming government? Or do we seriously maintain that more good can be done by a centralized office run by fallen human beings (no matter how decent their intentions) than by God working through the hearts of His people to address the valid hurts and injustices we see every day? Are we so untrusting of the hand of God that we think He needs our help in bringing about a justice we may misunderstand anyway? You see that this is a faith issue in addition to a logic issue. If we are truly concerned about the plight of the poor (and we should be! ), if we are truly concerned with justice for the downtrodden (and we should be! ), then we shouldn’t be expecting to make any headway on the road to love and mercy by combating the effects of sin with secular institutions! That would be like removing the engine of your Volkswagen and then trying to drive it home. The same state of sin which causes the “poor to be with [us] always” (Mt 26:11) is alive in every human institution that tries to combat it – leaving the church, with the engine of the Holy Spirit, as the only viable entity for grace, mercy and love in the world. If we are truly honest about our sinful condition, then we must realize that any justice and mercy that we are able to accomplish as Christians or as Christ’s Church, are only because of the power and goodness of God! We must realize that even our best intentions – seasoned with salt as they might be – are tainted by the selfishness and arrogance that infects our flesh. How much more are the intentions of the power-hungry and crooked unbelievers who are drawn into secular government? The bottom line is that God is the only one who is worthy of our trust; God is the only source of justice and mercy in this fallen world. If there be any justice or mercy, it is in spite of us and directly from Him. Praise be to God. Fifth, we should understand that the more freedom from outside influence an individual has with his time, money, and opportunity, the more freedom he has to glorify God with it. It is hypocritical to make the case for freedom within Christ and serfdom to our worldly leaders. We simply cannot credibly make the case that less freedom physically is good while spiritual slavery is bad. Either freedom is good, or it isn’t. In other words, how can we (Christians) say to the world, “God can set you free from your sin” while then saying, “The government should take what you have in order to do what you wouldn’t.” If we wouldn’t argue that slavery to some plantation owner in the 19th century was a good thing, why would we argue that indentured servitude to an earthly institution in the 21st century is? I have found that, to make a contented slave, it is necessary to make a thoughtless one. It is necessary to darken his moral and mental vision and, as far as possible, to annihilate the power of reason. He must be able to detect no inconsistencies in slavery; he must be made to feel that slavery is right; and he can be brought to that only when he ceased to be a man. Who do we think we are to decide who are the slaves and who are the freemen by taking from one to give to another? And who are we to make the case for the righteousness of that action by saying that one is more deserving to have what the other has worked hard to obtain? 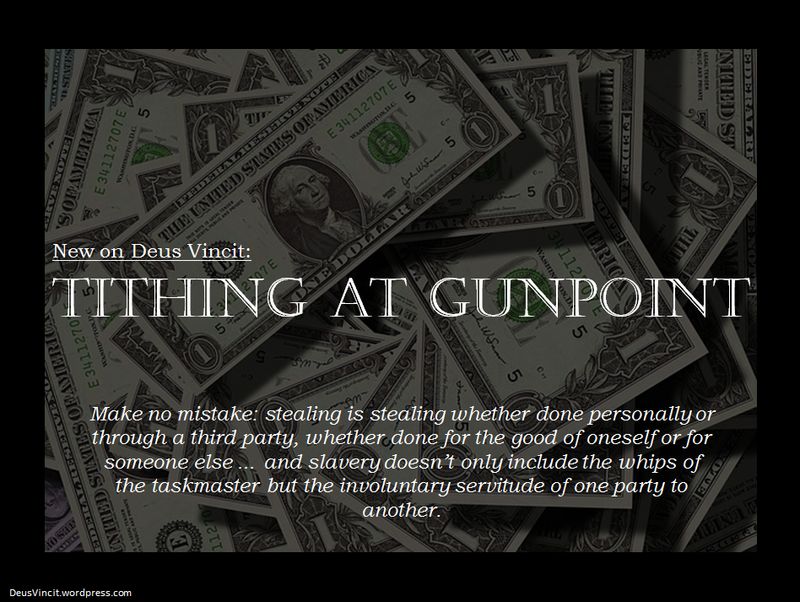 Make no mistake: stealing is stealing whether done personally or through a third party, whether done for the good of oneself or for someone else … and slavery doesn’t only include the whips of the taskmaster but the involuntary servitude of one party to another. I am sure that many more cases could be made regarding the evil of socialism, big government and all of the intermediates. I could make several cases myself from an economic perspective, in fact. But the most important takeaway is that it doesn’t seem to be at all rectifiable with the Gospel of Christ. Once again, we have been commanded to take care of those who are in need – there’s no getting around that, and we shouldn’t look for ways around it. But nor can we make a cohesive argument for compelling someone to support something against his own conscience; nor the exacerbation of the fleshly impulses to steal or covet; nor the expansion of the role of the state from that which God has given it; nor the misappropriation of Christian trust from God to the state; nor the decrease of freedom with the possessions and opportunity with which God has blessed us. Now … I need to give one qualifying thought to all of that which I said above: As soon as you become a Christian – as soon as you dedicate your life to God – nothing that you are and nothing that you have is yours anymore. It all becomes, out of necessity, a sacrifice of praise to God. It all must be used to bring glory to God because all of what you are must be consumed by Him in order that sin may no longer reign within you. Therefore, this freedom which you have received through the redeeming blood of Christ carries with it a responsibility to love and care for those around you. Instead of being a slave to sin, you are now a bond-servant of Christ. It is the freest we will ever be, therefore we must be free with all that we are and with all that we have. But in no way is this responsibility any excuse for a person to place him/herself in the place of Christ as the intermediary between another person and God. Nor does it mean that Christ’s sacrifice is insufficient to save us apart from our proper giving. As if God’s grace could cover all of the evil in our hearts, but not the insufficiency of what we put in the offering plate or in the government’s coffers. In order to wrap things up, let’s look at the parable that many people (mis)use in order to argue for governmental care for the poor: The Good Samaritan (Luke 10:25-37). We need to state from the outset that all parables are stories of salvation, not some handy get-out-of-jail-free card for all of the people who want to compel others to do what they want. Ironically, the man who asked the question also knew the answer (he was an “expert in the law” after all). When Jesus asked him what he thought the answer was, he replied, “’Love the Lord your God with all your heart and with all your soul and with all your strength and with all your mind’; and, ‘Love your neighbor as yourself.’” But then Luke says that, “he wanted to justify himself [his question, his reasoning, his interpretation of the law, his values], so he asked Jesus, ‘And who is my neighbor?’” And this prompts Jesus to give His parable. Do we honestly think we gain ANYTHING spiritually by forcing someone else to do what we have been called to do? I honestly want to know the answer to that question. Because if there IS something to be gained, why be at all concerned with Christ? Save yourself by buying a gun and make others tithe for you!